I like to think that some good can be found in anyone. I tested this assumption recently by re-reading some of the tripe written by the postmodernist's postmodernist, Jacques Derrida. I almost lost hope, and then it slowly dawned on me - the word deconstruction had some potential utility. Not the word as laboured over, and mangled unto meaninglessness by Derrida and his camp-followers. But a purer, more basic form of the word. In fact, my form of the word. Just as postmodernists have relentlessly stolen perfectly useful words from common parlance, and have rendered them meaningless. So I shall steal a postmodernist coinage and render it meaningful. 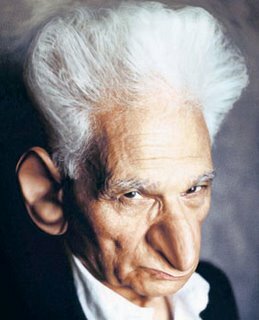 I will now deconstruct postmodernism, and the entire oevre of Jacques Derrida. Here it is. Proposition: deconstruction is to literature as horse manure is to a sunlit meadow.